How are you doing….I am so excited to share with you the GOOD NEWS i.e I have reached 150 followers on my blog! 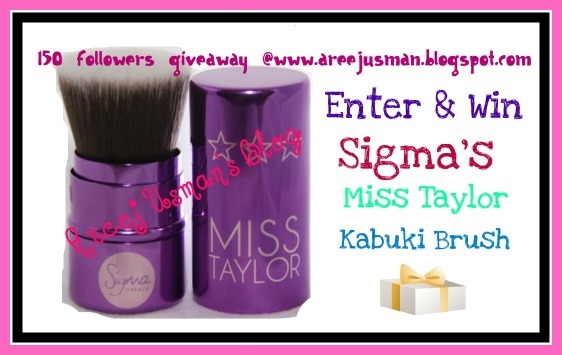 To Celebrate & to thank you all I am Hosting this Giveaway & the winner of this Giveaway willl recieve this lovely & glamorous looking brush i.e Sigma’s Miss Taylor Kabuki. Its sponered by SIGMA BEAUTY & Sigma will themselves ship the brush to the winner…! Exciting isnt it !! The Sigma Makeup retractable flat top kabuki is the easiest way to apply powder products such as blush, bronzer, foundation, and highlighter on-the-go. Practical and classy, the Hollywood Glamour collection is a must! The maximum number of entries that a person can get is 17. This Giveaway starts today on the 1st of June 2011 & will end on 30th of June 2011. I am new at this …I hope you take me into consideration …I really like your blog and really want to win …to get better at this. Hey dear! am a blogger from Pakistan. Honestly just browsing through good blogs to find smart writers like you to talk to me on various issues. Nice blog outlook and interesting write-ups. I write on relationships mostly as well as some funny stuff. Great giveaway 🙂 enter me please! Posted in my blog side bar. I am following your blog through GFC as Rida Rohail.